I wanted to share with you the latest news from Clairol. They have a great new tool that will make you look picture perfect, even when you’re between colorings. 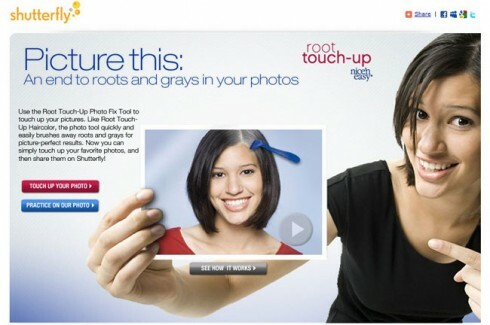 Clairol’s Nice ‘n Easy Root Touch-Up, in partnership with Shutterfly.com, created a Root Touch Up Photo Tool, similar to the popular “red-eye reduction” feature, in honor of Root Touch-Up’s fifth anniversary. Now you and your friends can upload photos to Shutterfly.com and remove unsightly roots from your photographs, making every photo frame-worthy, even when you’re caught without your roots touched-up! This unique tool can be viewed at http://shutterfly.triaddigital.com/clairolrtu/. Be sure to check out the link when you have a chance and let me know what you think! This could possibly be the best photo touch-up tool on the planet, lol!! I hear it works really well! Let me know what you think! Shop Off White Lace Dresses, Black Heels, Saddle Bags, Floral Long Dresses and more. Get this widget.